Egyptian Irrigation Minister Mohamed Bahaa El-Din has said that the Egyptian government "will not give up on one drop of water," in reference to the growing Egypt-Ethiopia crisis over the plans of the latter to build a new dam. "The state has started taking procedures that we will not announce,” he added, according to the state-owned MENA news agency Wednesday. “We are suffering a yearly deficit of water that reaches LE7 billion,” the minister added. Earlier this week, Bahaa El-Din said that Ethiopia's planned Renaissance Dam project was sure to negatively affect the electricity-generating capacity of Egypt's High Dam. 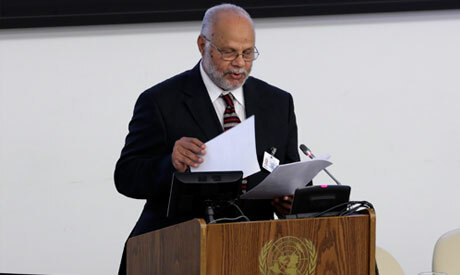 At a meeting between electricity ministry officials and members of Egypt's Shura Council (the upper house of parliament), Bahaa El-Din asserted that the Ethiopian dam — especially during periods of water scarcity — would lead to "disaster" for Egypt, Al-Ahram's Arabic-language news website reported. Last week, in the immediate wake of Egyptian President Mohamed Morsi's visit to Addis Ababa, Ethiopia began diverting part of the Blue Nile in preparation for the dam's construction. Most of Egypt's annual quota of Nile water, which — according to a colonial-era water-sharing treaty — stands at 55 billion cubic metres, comes from the Blue Nile. The decades-old water-sharing agreement gives Egypt, along with Sudan, the lion's share of Nile water. In 2010, Egypt and Sudan refused to join the Entebbe Agreement signed between Ethiopia and five other Nile Basin countries, which sought to reallocate Nile waters on a more equitable basis. Signatories argued that the old agreement had been written by colonial powers and unfairly favoured Egypt and Sudan. Do you mess up with giver by choice? If Egypt is the gift of Nile, Ethiopia is the giver of Nile. What Egypt thinks it is trying to do is, saving its share of water at the risk of losing Ethiopia's goodwill. That is, of course, an inverted logic to the existing reality. The end result, without a doubt, will be: losing both. This becomes absurd while you have an easy choice: save your water and respect the giver. Why would you threaten the all-time giver while the giver country is saying "I'm not going to do any harm on your interests. I'll invite to evaluate my planned projects in case unforeseen consequences; my dam is to your benefit; I can even let you co-own this dam." If Egypt prefers to sabotage these projects, then it is buying a generational enemty with Ethiopia, the giver. Then, God know what Ethiopians can do to harm Egypt in so many possible ways. fits perfect to this goverment! He will make his career. Are these Egyptians who keep announcing "covert" operations for real? Next thing you know they may come up with a demand for Ethiopia to INCREASE the water for they have a DEFICIT now. Calm down and think through things before issuing lame statements. STOP abusing the water you get and you will certainly have plenty. You can't deal with this issue without a radical change in your thinking. A 21st century solution for a 21st century problems. Antiquated approaches wont help you. Gosh... What have you Egyptians done with your revolution? Egypt sure feels like 1974 Ethiopia. You got a hi-jacked Cause. If that is the case the worst is yet to come. I wish your sane and deliberate children to take control of this challenge and deal with it as matured people would do. Unless the Egyptian politicians are sitting on their brain what they have been saying recently is nothing short of arrogance and racist. They have no respect for the lives of other people, specially Africans. The response from Egypt in the coming months decides whether or not Egypt as we know it will survive. Please read the US State Departments response to the diversion of the blue nile. U.S. Response to Ethiopia's Diversion of the Blue Nile Media Note Office of the Spokesperson Washington, DC Question Taken at the May 28, 2013 Daily Press Briefing May 29, 2013 Question: What is the U.S. position on Ethiopia’s recent move to divert the course of the Blue Nile and the outrage expressed by Egypt and Sudan? Answer: We commend the current efforts of Egypt, Ethiopia and Sudan to jointly examine the downstream impacts of the Grand Ethiopian Renaissance Dam (GERD). We urge the countries to continue working together to minimize negative downstream impacts and work together to jointly develop the Blue Nile basin for the benefit of all the people of the region. A minister of the government discusses in public covert opeartions against another country? I can just see the newspaper headlines now, "Egypt to Launch a Surprise Attack After Friday Prayers." James Bond's job is safe.